Back from the Valentine hiatus, the boys send you folks some love with some spiffy comic book reviews. After main reviews of Robin #183, Jersey Gods #1, and Dark Avengers #2, EJ, Alex, and John, do a round of quick shots including Gaiman’s Whatever Happened to the Caped Crusader. In War of Thumbs, the three nerds then discuss the sneak peeks at the Cobra Commander mask and the TF2 Devastator. Lastly, to celebrate Valentine’s (albeit late), the boys answer a listener question and spill their guts about which comic book lady they would like to date. Andy Kubert is back on the book with no less than superstar modern fanatsy scribe Neil Gaiman. Anyone else worried about where this one’s going? No? Fine. But join us for this week episode anyway to see what we think of this and the week’s other hot books. Hello there, weird folk of the interwebs! How’s your sister? Anyways, I’m back to bring you fabulous gifts, enough to make you famous as that dude on the TV selling grilling hardware! Yes! Comics is serious business, so serious that I even give time to choose the best cover of the comics I got last week! Get ready for more seriousness, because this one’s seriously serious! To be honest, I wasn’t a big fan of Jason Pearson’s art until recently when he started doing covers and when he did Joker’s Asylum: Penguin. For some reason, I find his “new” style much more appealing than the one he used on the original Body Bags mini (not that his art was bad back then). 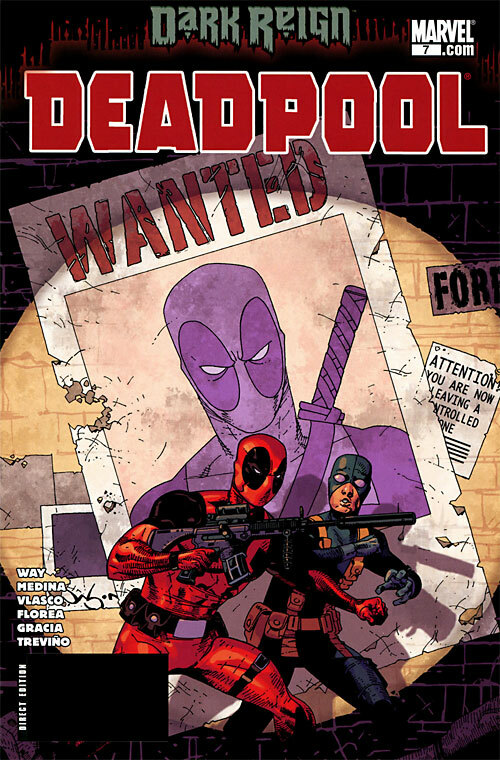 So when he started doing the covers for Deadpool, I was as happy as a high-school girl at an NSync concert! I even thought he’ll do the interiors! But anyway, aside from his awesome art, what really attracted me to this cover is that it’s like a very well-done tribute-like to the Uncanny X-Men #141 Wolvie/Kitty cover done by John Byrne. And that basically made this cover the sure winner. Ahoy hoy, people shmeople! EJ, Alex, and John are back with reviews of this past week’s hottest books. For main reviews, the boys dive into Secret Warriors #1, Hotwire #1, and Crossed #3! After a round of quick shots that gives Final Crisis #7 it’s due attention, the three bastards then tackle burning issues such as Christian Bale’s on-set outburst, the recently-released G.I. Joe teaser trailer, and which DC character deserves his or her own book. Hi hello folks! We’re sorry for not having an episode for last week. The boys were pretty busy with stuff in real life that we lost time to do the show. Don’t worry, we’ll be sure to deliver one this week and add some more stuff to make up for last week’s loss. Anyway, on to more pressing matters. One of the things that make a good comic book cover is how it can make someone pick up the book just by looking at the cover. I haven’t read AMS Extra #1, but when I saw this cover I felt that it could be an interesting book. And it is! I do love Paolo Rivera’s art, it has that sense of flexibility Spider-Man when he draws Spider-Man, and it has that “organic” feel to it. I can’t really describe it, but it feels like Marcos Martin’s art. Flexible & curvy. Also, I don’t know if any of you noticed lately how Marvel’s titles on their comics seem out of place? Like the art is there and they just pasted the title without thinking of design? Though there are exemptions such as Dark Tower. Well, this cover’s title fits the what the cover would like to express. 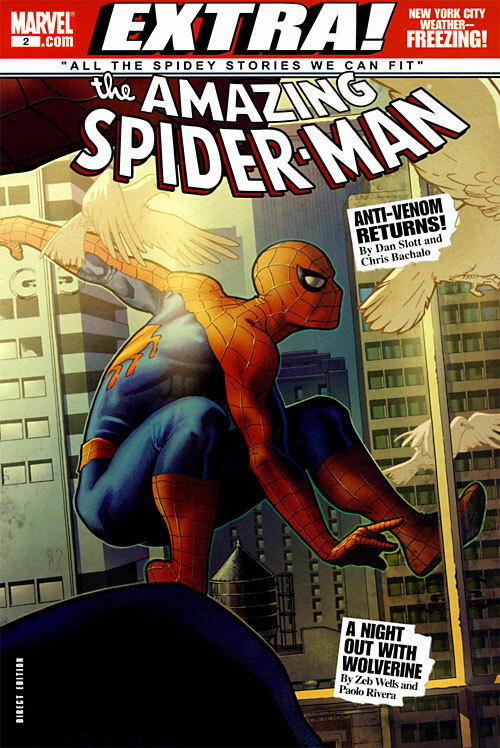 It’s like a magazine/newspaper, with a picture of Spidey infront, and some small captions to hint what’s inside. That’s pretty neat. So what’s your favorite cover of last week?